OPPO takes selfies to the runway creating a one of a kind selfie fashion show! 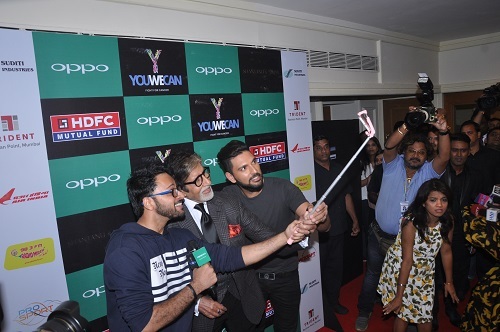 Mumbai, 3rd September 2016 —The ever-evolving global smartphone brand OPPO, created a stir in the fashion industry with a first of its kind – Selfie Fashion Show at theYouWeCan Fashion Show in association with ace cricketer, Yuvraj Singh. OPPO, the title sponsors of the event, stepped up the selfie and style quotient at this event where Yuvraj Singh launched a new fashion line. The event was graced by A listers from the Bollywood and Cricket industry who lit the runway on fire with their perfect selfies clicked with the OPPO F1s. The event’s proceedings are being donated to the YouWeCan Foundation. Shantanu & Nikhil. The show stopper, Yuvraj Singh along with other prominent sports personalities likeZaheer Khan, Harbhajan Singh, Saurav Ganguly, Chris Gayle, Sushil Kumar and Mary Kom amongst others, walked the ramp with the OPPO F1s and showed the audience how a perfect selfie is clicked! Yuvraj Singh is OPPO’s first sports ambassador and the brand associated with the ‘YouWeCan’ Foundation in the past for a charity campaign to raise awareness about cancer and facilitate cancer screening wherein the brand donated INR 40 lakhs as donation money.